The NITECORE MH12GT 1000 Lumen Compact flashlight brings the Grand Throw upgrade to the best-selling MH12. The improved CREE XP-L HI V3 LED offers up to 349 yards throw and a peak beam intensity of 25700cd - a 190% increase from its predecessor. The included 18650 rechargeable battery has also been upgraded to a high capacity 3400mAH cell which can provide up to 520 hours runtime on a single charge. Suited for tactical use, the MH12GT is easily operated via a dual tail cap and side switch user interface. A single tail cap button allows for 1-handed operation of on/off functionality while a conveniently located side switch lets users select from 4 brightness levels and 3 special modes. Add power to the MH12GT easily with the built-in USB charging port and included charging cable. Simply connect the MH12GT to any available USB power source and the blue charging indicator will turn off upon completion. (Note: The MH12GT needs to be turned on while charging) The charging indicator also doubles as a power indicator to alert users of low battery levels. Constructed from durable, aero-grade aluminum, the MH12GT is built to withstand work and play. The slim 1 in. body is ideal for everyday carry making the MH12GT your new go-to flashlight. Tbook.com crawls the web to find the best prices and availability on Flashlights and related Tools and Hardware products like NITECORE Multitask Hybrid Series MH12GT 1000 Lumens LED Rechargeable Flashlight. For this page, related items include products we find that match the following keywords: "Flashlight" at our vendor partner Home Depot. 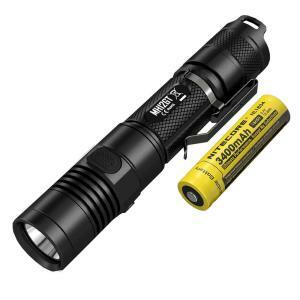 NITECORE Multitask Hybrid Series MH12GT 1000 Lumens LED Rechargeable Flashlight is one of 152 Flashlights and related products listed in the Tools and Hardware section of Tbook.com If you have any questions on this product, please give us a call at 734-971-1210 during the hours of 9am - 5pm EST for assistance. Thank you for shopping at Tbook.com, the Internet Department Store!